Is Ducati’s full-blooded adventure tourer really the multitasker it promises to be? It is a bit ironic that adventure tourers aren’t among the most popular motorcycles in the country. Buyers seem to prefer sportsbikes, streetbikes and cruisers over them, despite the fact that adventure tourers will happily go where none of these will. One of the reasons is that a lot of buyers find adventure tourers too big, heavy and cumbersome to ride every day. Not to mention, the quirky styling does not suit everyone’s tastes. Ducati’s new Multistrada promises to chuck all of that out the window. It looks good, gets Ducati’s flagship superbike’s engine, and has an electronics package that promises to make riding the bike ridiculously easy, irrespective of where you ride it. So has Ducati redefined the adventure touring segment? 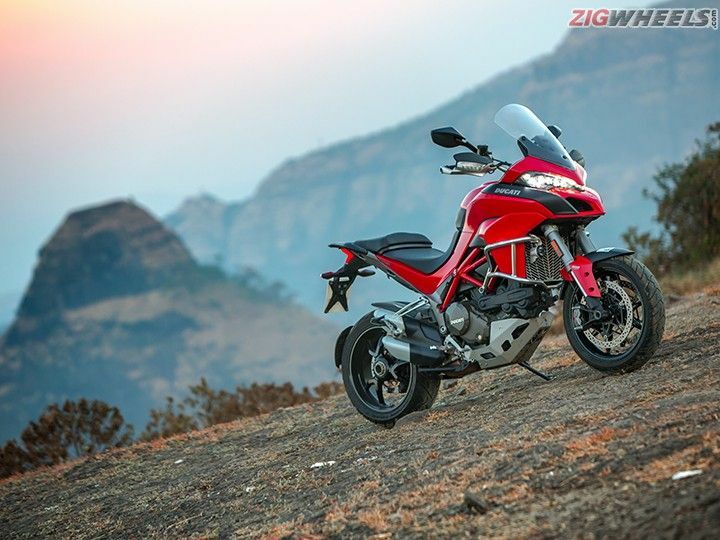 We spent a few days aboard the fully-loaded Multistrada 1200S to find out. And the results, may I add, are interesting. Let’s address the elephant in the room first. Adventure tourers have traditionally been designed in a way that justifies them being ridden out in the open, as opposed to taking a place of pride in living rooms, unlike many supersport machines. Function has preceded form, but the beak-like noses and quirky designs haven’t appealed to a lot of buyers. The Multistrada changes that notion as its all-LED headlights are inspired from the Panigale’s, and I’m yet to find someone who doesn’t find the 959 Panigale or 1299 Panigale's headlights good looking. In fact, the execution of the design is such that the stacks of LEDs complement the Multistrada’s beak-like nose. Curvy lines dominate the rest of the design, and the rear slims up to offer a front heavy stance. The scooped, low saddle for the rider preceding the tall pillion seat looks nice and compliments the rear, which is a typical Ducati affair with the single-sided swingarm. Slashed twin exhausts end before the rear wheel, offering an unobstructed view of the Y-shaped 3-spoke alloy. Our test bike also came with aftermarket accessories like fairing and radiator guards, fog lights and a bash plate underneath, apart from more purposeful and grippier aluminium footrests. From a distance the Multistrada looks deceptively small, more like a large supermoto with its 17-inch wheels, but walk up to it and you know this is a full-sized adventure tourer. Knuckle guards and a tall, adjustable flyscreen scream touring, while the tall handlebar and slightly rear set footpegs promise comfort. Getting onto the motorcycle was easier than expected, courtesy lowered seat height. Seat height is adjustable – minimum is 825mm, and can go up to 845mm, and this will be a boon for shorter riders. It’s only once you sit on the bike that you realise how wide the front is – the handlebar is wide and so is the fairing, and of course the 20-litre fuel tank. Seating is comfortable and offers a towering view, letting you look over most cars on the road. The pillion seat is comfortable too, and extended hours on the road are not a problem for either rider or pillion. The five-inch TFT dash is a coloured unit and looks so futuristic and offers a resolution so crisp, you’d be forgiven to assume it is a touchscreen. Only the S gets it, while the standard 1200 gets a monochrome unit. It offers tons of information and lets you customise virtually everything, but more on that later. To the heart of the matter then, the 1198cc L-twin (90-degree V-twin) engine. This is an updated version of Ducati’s Testastretta engine with DVT (Desmodromic Valve Timing). It features variable valve timings for the intake and exhaust camshafts both, which Ducati claims makes for the higher output, smoother delivery and more linear torque curve. In this guise the engine offers a rather scary 162PS along with 136Nm of torque. Lest you forget, 162PS is what superbikes offered until a few years ago, while 136Nm is higher than some of the current 200PS superbikes on sale. For instance, the current Kawasaki ZX-10R’s inline four motor makes ‘only’ 113Nm in comparison. A relatively higher torque output, with peak torque on offer at lower revs has always been one of the most likeable aspects of a V-twin engine. What’s even more interesting is that the Multistrada’s engine uses two spark plugs on each cylinder for better combustion. It feels extremely smooth and the bike is so quick to build speeds, you can almost never get to the limits of the bike’s performance. Not that you feel the need to – there’s a surge of torque above 3000rpm at all times, and in our VBox tests the 1200S accelerated to 100kmph in a scant 3.71 seconds, which is superbike territory. 160kmph came up in just seven and half seconds, and the bike accelerated fiercely way past 200kmph. That’s where the electronics also help. The suite is so comprehensive, it deserves a standalone review. The new generation Multistrada features an Inertial Management Unit now, apart from four ECU maps – Sport, Touring, Urban and Enduro. Sport and Touring modes offer 162PS, and as the name suggests Sport is the most aggressive mode, while delivery is relatively softer in Touring. Output is reduced to 100PS in Urban and Enduro, with an even softer delivery. What’s noteworthy is that you can customise every single aspect of each mode. That includes three predefined settings for power delivery, 8 levels of traction control, 3 ABS levels and 8 levels for Ducati Wheelie Control. Then there’s predefined suspension settings to choose from, and you can choose whether you are riding alone, with a pillion, with just luggage or with luggage and pillion both! Ducati says the Multistrada is essentially four motorcycles packaged into one, and the stark difference between the engine maps and performance makes us want to agree. The bike can become as docile as you want it to be, or an absolute hoot depending on the settings you choose. I’m rather convinced that in Sport mode the Multistrada will give middleweight supersport machines a run for their money in a straightline, if not litre-class superbikes, given its kerb weight of 235kg. On open highways I chose touring mode, enjoying the full power in a softer manner, and I can confirm, cruising at triple digits all day is a cinch for the big Ducati as I had no trouble being in the saddle for hours at a stretch. The Multistrada was quick to display its alter ego in Urban, and the reduced output and more progressive delivery made riding it extremely easy in city. Once used to the size, it’s also easy to manoeuvre the Multi through traffic with relative ease. Making quick progress is never an issue even in traffic, and the big L-twin does heat-up at low speeds but the heat never really threatens to roast your legs. Stock suspension settings in Urban also soak in broken roads remarkably well, and gliding over rough tarmac was surprisingly easy. Sport mode was particularly enjoyable in the hills, but the stiffest suspension settings made the front end jittery on less than smooth tarmac around fast bends. Softer suspension settings cured the problem, offering a far more confident feel. All that ride control is courtesy the Ducati Skyhook Suspension (DSS) system. This is a semi-active suspension and is way ahead of conventional motorcycle damping systems. At first glance the front forks and rear monoshock appear conventional but they’re not, as damping is controlled electronically, entirely. The suspension units feature sensors at both ends, which relay information to the ECU continuously, which accordingly adjusts damping real time to offer the best possible ride. The base Multistrada does not get the semi-active suspension though, and this is exclusive to the S.
Between Sport and Urban modes, the Multistrada can go from super stiff to extremely pliant, and there were times when the difference in ride quality was so big, I could barely believe I was still riding the same motorcycle. The suspension plays a huge role in making the Multistrada the motorcycle it is, besides the chassis, which benefits from Ducati’s immense expertise in making some of the world’s best handling sportsbikes. Confidence levels are almost un-adventure tourer like, as lightness and agility are closer to sportsbikes. The Multistrada is in fact easier and quicker to ride sticking your leg out around corners and counterbalancing yourself like on a supermoto, even around fast bends, on tarmac. The bike loves being flicked from side to side, corner after corner, while the suspension soaks in everything you throw at it, offering the confidence to push harder. This confidence backed by the strong engine performance makes the Multistrada a lot more fun to ride than you would expect of an adventure tourer. The long travel forks and dual sport rubber rob you of some confidence around faster corners though. The rear stays planted but the front tends to run a bit wide, though things never get out of hand, which is when you are reminded that the Multi is no sportsbike. The brakes deserve a special mention here as well. The Multistrada 1200S gets top of the line Brembo brakes with radial everything – right from the master cylinder to the caliper. Two 330mm semi-floating discs perform duty at the front, cornering ABS is standard equipment. A 265mm disc performs duty at the rear along with a floating calliper and gets cornering ABS as standard as well, and all of this is some serious kit for an adventure tourer. In our VBox tests the Multi came to a standstill from 100 kilometres an hour in just 43 metres, despite its size and weight. The bike feels confident off tarmac too, though the 1200S is certainly more road-biased. For off-road Ducati now has the Multistrada Enduro, but that’s not to say the 1200S doesn’t handle off tarmac. In Enduro mode, traction control allows you to spin the rear wheel at will, while ABS levels are dialled down, allowing greater control. The imposing dimensions of adventure tourers can make them cumbersome off tarmac, but the Multistrada begs to differ. The confidence it offers coupled with the easy going power delivery in Enduro mode make riding it off-road surprisingly easy and it feels almost like a mountain goat, a really large one though. To sum it up, the Multistrada 1200S is sportier and more fun than I expected of a full sized adventure tourer. With its mind-numbing performance it can really shame superbikes, while offering far better comfort and practicality. The semi-active Ducati Skyhook suspension state of the art, and so is the electronics package. The bike’s heft and long travel suspension mean it isn’t as agile or confident as a sportsbike, but is definitely a lot of fun. The Multistrada isn’t as intimidating as some of the other full-sized adventure tourers but is still big and heavy, and can be a handful for shorter riders. If you are keen on touring the world and living out of a motorcycle’s panniers, the Multistrada could be an ideal choice, as it is one of the most advanced, friendly, fast and comfortable adventure tourers on sale in the country. If you have the budget, the 1200S is the one to look at with the semi-active suspension and a few more tidbits, and is undoubtedly a lot more motorcycle than you would ever need! Share your experiences with Multistrada?